In the latest of our series of interviews with the Crew, we take a few minutes to catch up with Mechanic Dave. So, Dave. What is the mechanic’s role at the station? Well, I’m responsible for the maintenance of the lifeboat’s engines and for all of the machinery at the station. This includes the tractor, the winch in the boathouse and everything else that we use. I also keep an eye on the condition of the boat itself, so that I can tell when other repairs or maintenance are needed. The same goes for the boathouse, too. There’s always something that needs doing. And when we go out on exercise or on a shout, I keep an eye on the engines and the other bits of mechanical kit. They can take a bit of a pounding at times, so it’s a a case of making sure that everything’s running smoothly and that any issues are addressed quickly. It’s OK if you keep on top of it. Because we never know what the boat will be called upon to do, everything has to be in tip-top condition at all times. I have a list of daily checks and then other things that I do every week or every month. And if anything major needs doing, I can get on to it straight away. How does this all fit around your day job? This is my day job. 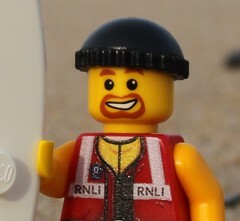 I’m the only paid, full-time member of the Crew, so the lifeboat station is my place of work. When we go out on a shout, though, I’m a volunteer like everyone else. Just better looking. I’m not sure there’s such a thing as an average day here, as so much depends on the time of year, the weather and what else is going on. But I generally get to the station at about half past eight and spend a couple of hours doing my daily checks on the boat and the other bits of kit around the station. I then spend another couple of hours working through things on my to-do list. Our volunteer lifeboat press officer usually calls by at some point during the morning and will sometimes show a school group around the station. So I’ll have a quick cup of tea with her and, if she has a group with her, will try to take a few minutes to say hello and to tell them about the lifeboat. After lunch, I usually have some paperwork to catch up on. This includes keeping records of the maintenance work that I have done, ordering new bits and pieces for the boat and generally keeping up to date with what’s going on. In the afternoons, I try to tackle larger jobs, usually things that I’ve notice need doing but that will take a bit more time. And just like the rest of the Crew, my pager can go off at any time. Although it usually goes off just after five o’clock, when I’m thinking about heading home for my dinner! What makes being a mechanic at a lifeboat station different from being a mechanic at, say, a local garage? Two things, I’d say. Firstly, the immense variety of things that I get to work on, from the boat and the tractor to the machinery in the boathouse. It’s not just putting new exhausts on family saloons here! And secondly, because the lifeboat has to be ready to go at a moment’s notice, I can’t leave a job half-done. There’s no taking something apart and then wandering off for a cup of tea. It’s not really. There’s a lot to do, but if you’re organised then it’s not too bad. And we have a huge amount of back-up from the rest of the RNLI. For example, if our boat needs to be taken ‘off service’ for a major service or repairs, then we can get a ‘relief’ lifeboat to take her place. And when we get new pieces of kit, there’s detailed training on how it works and how I need to maintain it. I’m not sure how you manage to stay on top of it all. Checklists. Lots of checklists. And a good feel for how things work. It’s something that mechanics develop over time. Like a sixth sense. The ginger ninja, that’s me. This entry was posted in Interview with the Crew and tagged Interview, Lifeboats, Mechanic Dave, RNLI, The Lifeboat Crew by Simon Perks. Bookmark the permalink.